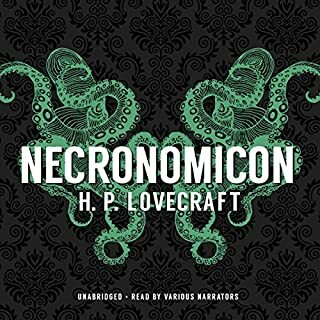 Fans of H. P. Lovecraft's famously malevolent tentacle monster, Cthulu, will love this collection of 27 stories inspired by the influential fantasy creature. Weird, modern, and alien, these tales are among the best examples of the Cthulu Mythos story cycle. 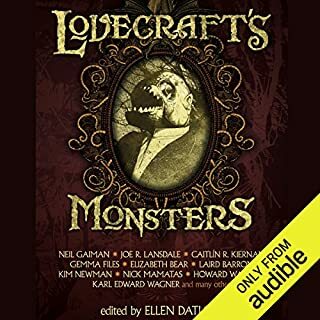 Meticulously compiled by Ross E. Lockhart, stories in this volume include contributions from Kage Baker, Caitlin R. Kiernan, Ramsey Campbell, and many more. Somber and menacing performances from Teresa DeBerry and screen and voice actor Fleet Cooper add to the air of mystery and foreboding. The Cthulhu Mythos is one of the 20th century's most singularly recognizable literary creations. 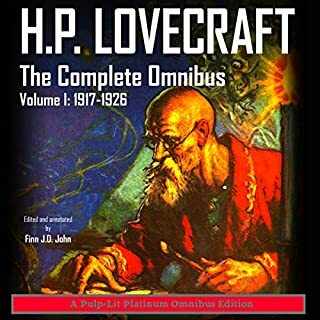 Initially created by H. P. Lovecraft and a group of his amorphous contemporaries (the so-called "Lovecraft Circle"), The Cthulhu Mythos story cycle has taken on a convoluted, cyclopean life of its own. Some of the most prodigious writers of the 20th century, and some of the most astounding writers of the 21st century have planted their seeds in this fertile soil. The Book of Cthulhu harvests the weirdest and most corpulent crop of these modern mythos tales. 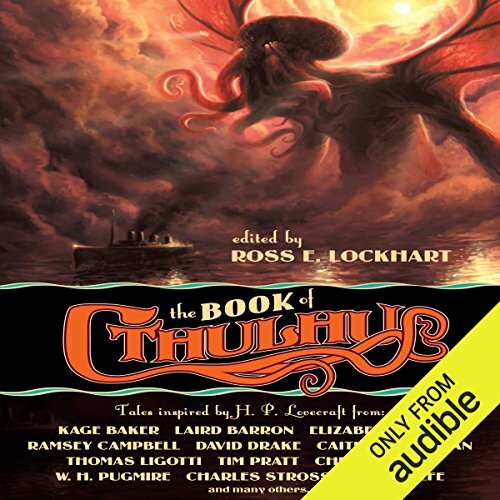 From weird fiction masters to enigmatic rising stars, The Book of Cthulhu demonstrates how mythos fiction has been a major cultural meme throughout the 20th century, and how this type of story is still salient, and terribly powerful today. 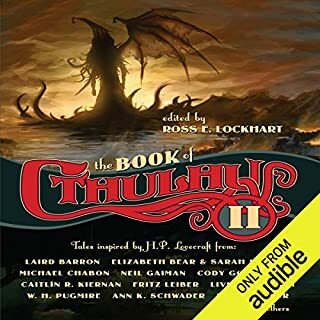 ©2011 Ross E. Lockhart (P)2013 Audible, Inc.
Lovecraft was great. These authors have had their own successes and take his ideas even higher. I was expecting a tribute book. I wasn't expecting Lovecraft's ideas amped up into overdrive. Well done! 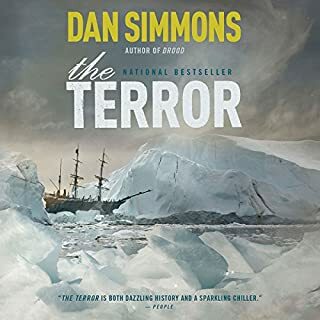 These stories (most) were awesome and Fleet's reading was so creative and powerful I honestly would recommend this to friends as an audio vs hard copy printed/kindle, etc. another review blasted Fleets performance and I couldn't disagree more. In fact I felt Teresa's performance to be the weak link. It felt overly sensual and forced where it didn't need to be. The best part of this collection however is the collection itself. 90% (imho) of these stories were great and THAT in a collection of shirts is (in my experience) rare. Hard to tell with one story stopped and the next one started. I don't know if this is more a comment about the Audible playing software, the production itself, or the performances. With two narrators there was some nice variety between a female protagonist and a male protagonist from story to story. What I did notice however, was that one story would roll right into the next, and if they were both done by the same narrator it was hard to tell the story had even stopped and the new one had started. I don't know if that's a result of how the Audible playing software goes from track to track or chapter to chapter, or if say an MP3 CD would've yielded the same result, or even an audio cd. But clearly, as a track ended a story, there was no breath or ending space before the next element began. One might also say that a lot of the time a story didn't end with a certain amount of aural finality for lack of a better term, or a new title to a new story was read with any different emphasis. That sounds like a lot to describe something insignificant, but multiple times I was wondering where characters had disappeared to, when in fact a while new story had started. I do know that while I enjoyed The collection, I had to give it 100% of my focus and not simply have it on in the background. Copper is amazing, his choppy tone and diction, along with his vocal characterization gives these stories a sense of realism. DeBerry is less driving, but her soft tones provide her readings with a "bedtime story" feel which lends a real sense of creepiness to them. Overall totally worth it, interesting ideas and good narration. Great collection of stories. Grim, enticing, mysterious. Some were brutal others more subtle. Overall a fun experience. I'm downloading the second one right now. Loved Cooper's performance, but hated DeBerry's. I wish he would have read the entire book. The last story, "The men of Porlock" was my favorite! The performance by the reader was flawless. Must hear. Spooky! I am a huge fan of Lovecraft, and have been for the past 22 years. 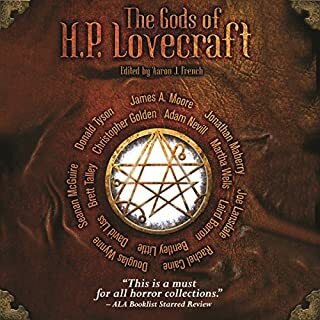 These stories do a pretty good job of capturing the creepiness of the Elder Gods, and if you are a Lovecraft fan I recommend a physical copy. Teresa DeBerry does a fine job of the few stories she gets to narrate. The majority of the stories are narrated by Fleet Cooper. Let's list a few of his wonderful tics, shall we? 1. Pronouncing "a" and "the" as if the following word begins with a consonant, even if it doesn't. 2. Sounding annoyed all the time. 3. Performing various "accents" which at best are inadequate, at worst, slightly racist. There are more. They're not even Lovecraftian mouthfuls like "batrachian" or "gibbous!" Full of great stories by some very talented authors. Steve Duffy's, Joe R. Lansdale's, and Laird Baron's stories are my favorite of the book.